Susan Heim on Parenting: Lucky Clover Giveaway Event: Enter to Win a 3-Pack of "The Purple Grumblies" Books (Paperback)! Lucky Clover Giveaway Event: Enter to Win a 3-Pack of "The Purple Grumblies" Books (Paperback)! Can you believe that spring is right around the corner? I know that we are all getting excited for the weather to start warming up! But we don't want to forget the month we're in. 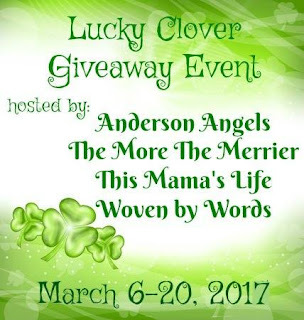 Anderson's Angels, This Mamas Life, The More The Merrier and Woven by Words are very excited to bring you the Lucky Clover Giveaway Event! We've teamed up with over 20 other wonderful bloggers to bring you another great giveaway hop! Each blog has gathered a prize package worth $25 or more, so be sure to visit each blog and enter. 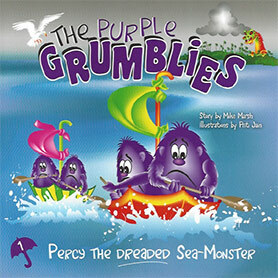 For my giveaway, I am offering a lucky winner three (3) paperback books in The Purple Grumblies series by Mike Marsh! The Purple Grumblies are not swashbuckling heroes. They can't run. They're all thumbs when it comes to lifting or climbing anything. They're just plain awkward, small, grumpy, and … purple! And yet … these underdogs manage to outwit their adversaries time and time again. How do they do it? Author Mike Marsh wanted to create anti-heroes with a conscience; to show how brain overcomes brawn and how little Davids can defeat any number of giant Goliaths. Good must always triumph over evil. Therefore, he created this series of illustrated children's books (ages 3-7), based on stories he created for his children and grandchildren over the years. The Grumblies are a fun collection, perfect for bedtime reading! 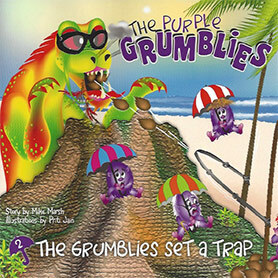 Visit www.purplegrumblies.com to see all 15 of The Purple Grumblies books! One lucky winner will receive paperback copies of three books in the series. Enter through the Rafflecopter form below. This giveaway is open to U.S. residents only and ends at 11:59 PM EST on March 20, 2017. Now hop around to the other blogs participating in this event for the opportunity to win more great prizes! Disclosure: The author has generously provided complimentary books for review and giveaway. Hosts & participating hop bloggers of the Lucky Clover Event are not responsible for sponsors or self-sponsoring bloggers that do not fulfill prize obligations. I like the Kaylani's Haven Book where they save the whales. I think The Grumblies & The Hurricane would be nice for my grandkids. We live in an area where we have seen a couple of hurricanes. All of the purple grumbles books. These books look adorable! I like the Shipwreck book :) It just looks fun! My niece would like them all. POOUFF! looks like a good one. I would like to get the Christmas In Bermuda book for the girls. I also like the The Grumblies & The Hurricane, my son would love that one. I'd probably start with the first book, 'Percy the Dreaded Sea Monster', just because it looks like the story needs to be read more or less sequentially. Some of the books are 'part 2', 'part 3', etc. They all look very cute and I know my great granddaughter would pick The Grumblies and the Volcano!! They all look great, however, The Ghost of Bumboo especially caught my attention. Living in a hurricane area, it is important to learn that disasters happen, but with this book, the scary part will go away and the sun will shine again. Would love to win these books for my grandkids - I like all of them! I'd like Christmas in Bermuda. Thanks for the chance! I like the, The Ghost of Bumboo. My daughter would like Christmas in Bermuda. Thank you! Bumboo Walks the Plank looks like a good one! Shipwreck! looks like a good book. I like The Grumblies save the whale. I think my girls would enjoy it . I like the Battle Cry, I like them all it was hard to choose just one. Quicksand.. because with a character named Captain Vermin von Trasch.. I mean how can I not? The Grumbles Set a Trap's cover caught my interest as I wonder why the umbrellas are being used. These look like cute books, Christmas In Bermuda caught my eye. The skyrats capture the grumbles catches my eye because of the pirates, my son loves pirates! I like Kaylani's haven. My dog's name was Kailani - so close! Bumboo Walks the Plank looks really cute. so many neat titles! i would like to try 'set a trap' 'christmas' and The Grumblies & the Volcano with my girls! i would love to read them all. The Skyrats Capture the Grumblies caught my eye. Like The Ghost of Bumboo. The Skyrats Capture the Grumblies looks really cute. Wow, they have so many to pick from. I'd go with Christmas In Bermuda because my daughter adores Christmas. The Grumblies and the Volcano!! The Grumblies Set a Trap caught my eye. The Grumblies & the Volcano looks fun! I think that the Shipwreck! look fun! Bumboo Walks the Plank looks like a fun book. The Ghost of Bumboo looks really cute. I like The Grumblies & The Hurricane! The The Grumblies & the Volcano book looks fun! The Grumblies & The Hurricane my grandon would like. My granddaughters would like The Grumblies and the hurricane. Quicksand sounds like a good one! My daughter would probably pick The Grumblies & the Volcano first! The Purple Grumblies Save the Elephants.